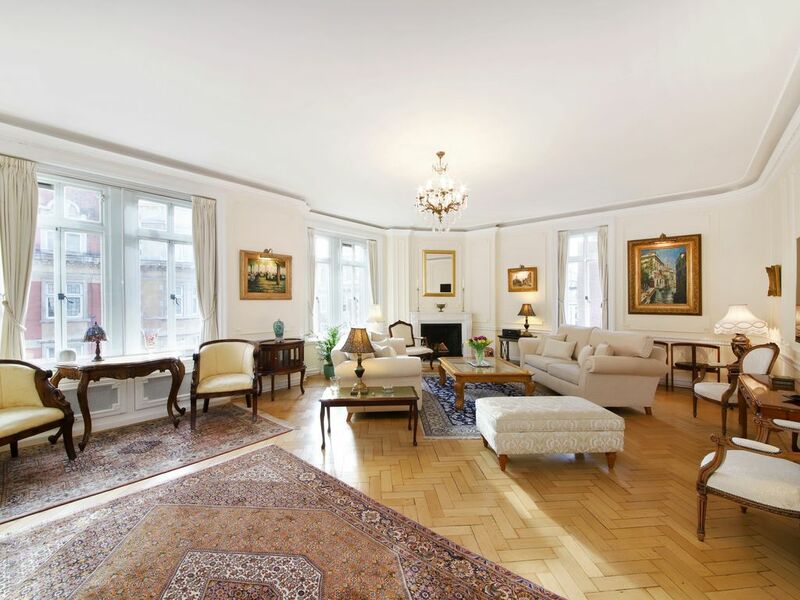 With high ceilings, parquet wood floors and elegant décor throughout, this stunning luxury three bedroomed apartment offers abundant living space and a great location close to Oxford Street and Regents Park. Situated on the third floor of a grand mansion block the property comprises a generously sized reception room with adjoining dining room, kitchen, three extra large bedrooms, 3 bathrooms, one with Jacuzzi. Situated in a popular residential area close to Regent Street, Oxford Circus, Soho and gorgeous Regents Park. Great Portland Street Underground Station (Circle, Metropolitan and Hammersmith and City lines) and Oxford Circus (Central and Bakerloo Lines) is close by for links into the City and the West End. I highly recommend this place . The host is very kind. We could not have been happier with our recent stay in this apartment! We are a family of five and there was more than enough room for all of us. Ian, our host, was very gracious and easily available. Located in a beautiful section of London, it is an easy walk to Regent's Park, shopping, restaurants, groceries and very convenient to the Underground and bus stops. Anyone vacationing with children will appreciate the laundry facilities and three bathrooms contained within the apartment. There is no doubt that staying in this elegant apartment elevated our visit to London and became one of our favorite parts of the trip itself. We were so happy with this choice that we would plan a future trip to London based upon its availability! My family and I have stayed at many five star hotels and apartments in London and only one word comes to mind to describe this one.....WOW!!!!! This is an impeccable, sophisticated and chic 3 bedroom/3 bathroom apartment. All of the rooms are well appointed, large and comfortable. The bathrooms are new and very modern with heated floors and towel warmers. The location is superb!!! It is in the heart of it all. Everything that you need or want is literally right there. You can walk to so many attractions, restaurants and shops. The infamous Regents and Oxford Street are both a 10 minute walk away. Regents Park is practically your backyard and it is fabulous!!! All of the major tube lines go to the Portland station which is a 5 minute walk from the apartment. Not to mention that it was never more than a three minute wait for a taxi or Uber. The biggest WOW factor was dealing with Ian and Inge. From start to finish it was professionalism at its best!!!! It was an absolute pleasure and we can't wait to return. Stunning flat in the perfect location with a great host! We cannot express enough how much we enjoyed our stay at Ian's flat. First of all, Ian is a great host. He communicated with us countless times prior to our arrival and then was completely available to guide us during our stay. We are a family of five and stayed for 8 days at 2 Weymouth. We found the flat to be elegantly decorated, very comfortable, spacious and livable. It was extremely clean, just as described, provided all we needed for our stay including socket adapters. The flat has the finest appointments. In fact, the kitchen appliances are of such nice quality, we invested in a nice kettle when we came home. We really appreciated the fact that the flat ws all on one floor with lift access. The location is superb. Well within walking distance to all the top spots and as well as easy access to the underground. Plus, the cross streets were easily recognizable by the taxi drivers. There is a Starbucks next door and a grocery market across the street as well as restaurants. Just perfect! We cannot emphasize enough how much the quality of the flat and the location positively impacted our stay. We would definitely stay at Ian's flat if ever in London. And, it was such a pleasure working with Ian. He was so patient with our many concerns and questions even during the holidays. It was a five-star trip! We have and we will continue to recommend Ian's property to our friends. Thank you, Ian. Our family spent Christmas week here and both the accommodation and location were ideal. Ian could not have been more welcoming and helpful - many thanks! Definitely our #1 choice when we visit London again! We highly recommend the apartment and Ian. The apartment is large, extremely well furnished, and in a great neighborhood. Ian was terrific to work with and he really cared that we had a good time while in London. We hated to leave. Very centrally located in a quiet street in Central London's fashionable and historic West End - just a 5 min walk from Oxford Circus/Oxford Street and the West End theatreland, 10 min walk from Picadilly Circus, and 15 min walk from Trafalgar Square and Buckingham Palace. Most museums and theatres are all within walking distance. 5 restaurants, a Starbucks, and a Sainsbury's supermarket are less than a 2 min walk. The gorgeous Regents Park is less than a 5 min walk. British Museum, National Art Gallery, Royal Institue of Art, and Madame Tussauds' wax museum are all within a 15 min walk. The majority of the London embassies are within a 10 min walk. - Security deposit required. - High-speed wireless internet included. - Porter in building. - Maid service is available. - Check-in 3 PM / Check-out 11 AM.